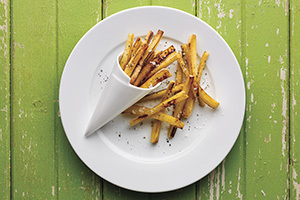 Peel and cut parsnips into long skinny ‘fries’; discard woody core. Heat oil in large nonstick skillet over medium heat until hot. Add parsnips, toss well and cook uncovered until lightly browned, about 5 minutes, stirring often. Add water and continue to cook, uncovered until parsnips are tender, golden brown and liquid evaporates, about 10 minutes. Season with salt and pepper to taste.